Olofson was sentenced to prison for 30 months for transferring a “machine gun” — which really was a lawful-to-own, semi-automatic AR-15 rifle which occasionally manifested a “hammer-follow” malfunction, resulting in short bursts followed by jamming. This case is well known in the “black-rifle” community, and has been featured on several occasions by Lou Dobbs. http://www.youtube.com/watch?v=rB237rfvHys — January 22, 2009.
http://www.youtube.com/watch?v=mJxbc6LOUgY — February 18, 2009. At the heart of Olofson’s Petition is the claim that his conviction was obtained and affirmed only by the adoption of a definition of “machine gun” directly contrary to the Supreme Court’s definition of that term in Staplesv. United States, 511 U.S. 600 (1994). This is an important case, as it puts at risk every owner of a semi-automatic rifle, shotgun or handgun of being convicted of a felony for owning a malfunctioning weapon that “doubles” or otherwise exhibits multiple-round fire. Gun Owners of America, Inc. and Gun Owners Foundation have funded the appellate work for this case. The Appendix to the Petition for Certiorari appears here. On September 30, 2009, the Montana Shooting Sports Association and the Virginia Citizens Defense League filed an amicus brief supporting our petition for certiorari. This brief explains the many ways in which conventional firearms can malfunction, resulting in multiple round fire, and the danger to gun owners everywhere of allowing Olofson’s conviction to stand. 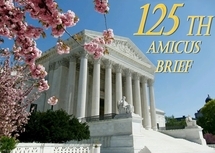 This instructive amicus brief was authored by David T. Hardy andE. Stewart Rhodes.